The MacDonald Swan Hotel HotelAccommodation at The Macdonald Swan Hotel offers more than 35 spacious and comfortable bedrooms including 6 feature rooms, all with views over the garden and fells. The Waggoners Restaurant At The Macdonald Swan Hotel can guarantee some of the finest modern British food, served in the warm and intimate atmosphere of The Waggoner’s Restaurant. The hotel is a close neighbour of William Wordsworth’s Dove Cottage, and within easy reach of Wordsworth’s Grave, Rydal, Derwent Water, Keswick and Cockermouth. A lake cruise is a great way to take in the beauty of the countryside. Fell walking, sailing, fishing, cycling, riding, golfing and shopping are just some of the other local attractions. The MacDonald Swan Hotel sometimes limits bookings to 2 or more days. Exec Family (3) sometimes limits bookings to 2 or more days. 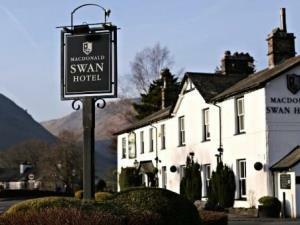 The Swan is located on the northern outskirts of the village of Grasmere, approximately half way between Windermere and Keswick on A591, from M6 either jct 36 or 40. Windermere station 8 miles away, Manchester airport 97 miles. The bedroom lock was broken, no solution offered by staff to resolve this. It was clear the problem with the lock was known by staff. We were left to struggle gaining access to the room. Reception staff were not proactive or helpful in offering information re local area. Breakfast staff were very hospitable and attentive. This is a PUB with rooms NOT a hotel and we feel that the room rate was extortionate and unreasonable in view of this. Bedroom corridoor walls were scuffed and in need of a re-paint. Very disappointing place to stay. We would not return. Not yet standard that we would expect from a MacDonald hotel!